GENERAL SANTOS CITY – World title prospect Jether Oliva will again showcase his punching prowess when he goes up against Rodel Tejares for the Mindanao Philippine Boxing Federation light flyweight crown on December 16 at the Oval Covered Court here. 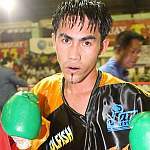 Oliva, who holds an immaculate record of 10 wins (eight via knockouts) against no defeat, is fresh from a five-round knockout win against tough Jerome Buntog in Talisay City on October 3 this year. It will be his fourth fight for the year. Tejares is from Cagayan de Oro City and totes a 6-6 record with one knockout victory. An amateur standout, Oliva main weapons are his punishing body blows and rock solid chin. He is also one of few boxers who finished their high school education. In fact, he finished a two-year computer course in a local IT school here through scholarship. He is managed by JC Boy Mananquil and is one of the bright prospects to emerge from this city and follow the footsteps of Manny Pacquiao. Pacquiao is promoting the December 16 card as his birthday presentation for his hometown folks. The card will also headline other promising fighters from General Santos and Sarangani. Mayor Jojo Lopez of Maasim in Sarangani said he has three upcoming boxers who will see action in the preliminary bouts. Lopez, whose prized ward Richie Mepranum made his successful US debut in the undercard of the De la Hoya-Pacquiao Dream Match, has a stable of over 15 professional and amateur boxers. Mepranum, who scored a unanimous decision win over American Cesar Lopez of El Paso, Texas, arrived Thursday with his trainer Jonathan Tinagsa and was greeted with a press conference at a local pizza house. Also seeing action is former Gensan amateur standout Jetli Purisima of the Rey Golingan stable.